“Shapes and Sizes” interacts with viewers through a wooden board game with detachable pieces of different shapes and sizes. 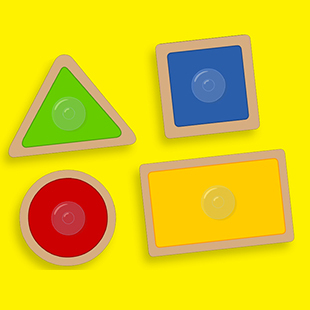 In every episode, young viewers are given the challenge of fitting four pieces, detached from the board, back in the right place. The four pieces share a common theme (e.g. animals, numbers, toys, food, etc.) in a rich variety of familiar and easily relatable images for babies and toddlers. See what time Shapes & Sizes is playing!